When you think of the best top shelf single malt scotch, it’s hard to top The Glenlivet in terms of quality and craftsmanship. This is no accident, it’s a reputation that’s been fiercely protected since the very start. Only a few kilometres from where the current distillery is based, founder George Smith set up an illegal still in the isolated Livet Valley among the bountiful springs. In 1822, despite everyone else in the area also having their own stills on the side, King George IV who was visiting Scotland on a state visit demanded to have a dram of George’s illegal whisky. It must have been a mighty drop because two years later liquor legislation changed and George could finally legalise the operation. The Glenlivet name now had weight and the fame of the valley’s spring water for making perfect whisky spread. Other Speyside producers saw the success of Smith and tried to bolt the name ‘Glenlivet’ to their bottles as well. However acting as a guardian of quality and craftmanship, Smith ensured a court ruling in 1884 that settled the matter – only one whisky could call itself “The Glenlivet”. While other whiskies could have used Glenlivet in their name, none could claim to be The Glenlivet. The Glenlivet is dedicated to continuing this legacy as the definitive Speyside Single Malt. With that in mind the spring water and tradecraft spirit of creation continues to this day. The Glenlivet continues to create inventive and original whiskies. The Glenlivet Nàdurra range (Nàdurra, meaning “natural” in Gaelic), is The Glenlivet’s newest range of small-batch whiskies. It is made using traditional 19th-century techniques and is the purest expression of The Glenlivet you will find. The difference is noticable in its full bodied flavour, as the whisky has been drawn straight from the cask. Also, unlike other modern whiskies, it’s non-chill filtered which offers complexity and a distinct creamy texture throughout the range. 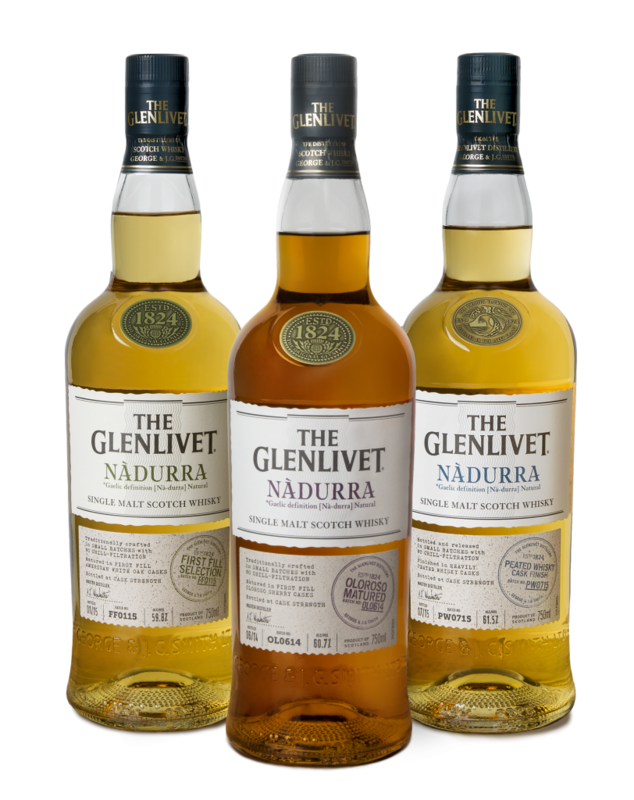 We here at M2 recommend keeping an eye on the brand new The Glenlivet Nàdurra Peated which will be in stores this October. The Glenlivet Nàdurra Peated Whisky Cask Finish is inspired by the authentic production processes used at The Glenlivet Distillery by its founder, George Smith, who originally used peat smoke to dry the malted barley. Finished in peated casks, the classic, smooth and fruity house style that has made the range so famous has been enriched with gentle, aromatic smoky notes, to offer a new experience to whisky enthusiasts. Using First Fill American Oak barrels, this whisky bursts with tropical fruits and creamy vanilla. At cask strength this expression provides a lively finish. Finished in Peated Whisky casks it brings a rare aromatic smoky taste to The Glenlivet unpeated spirit. Ripe with tangy marmalade and vanilla notes finishing with balanced layers of subtle smoke.